Have driven by on Sawtelle, finally got to stop in. It's a great space, love the center table. If you've ever been to Costco, you know you need to explore the warehouse floor to find the hidden gems. Like a treasure hunt, it's an adventure searching for something worthwhile. At 100 Wines, you can explore and go on your own treasure hunt for the evening's special bottle. You'll see the selection right when you walk into the room. My next visit, I'll have to come in on a Thursday and try the special, I love paella! 100 Wines was designed by famous restaurateur, Philippe Beltran. 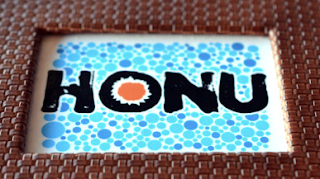 The Maui Visitors Bureau scheduled my visit to Honu Seafood and Pizza. It was a highlight for me, cause I'll FINALLY meet Chef/Owner Mark Ellman, I'll explain later. In the early 90's, I was on my way to Maui and heard a girl rave about a restaurant in Lahaina called Avalon. I decided to go and was instantly hooked, the food represented Hawai'i and the Pacific. I was surprised to find out that this dinner I enjoyed so much was part of a new cuisine movement and the Avalon chef/owner was part of this group. 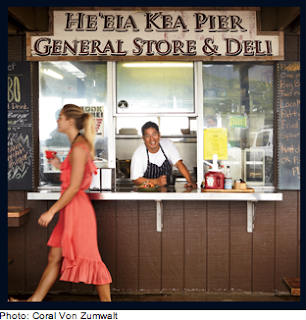 In 1991, Chef Mark was one of the twelve Hawai'i chefs to form the Hawai'i Regional Cuisine movement. Using ingredients grown/raised on the islands, combined with the Asian and Hawaiian culinary influences, add in some Western and European preparations, and you get a unique regional cuisine. When I started cooking professionally, I used what I've learned from this movement. 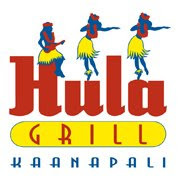 One of my favorite places on Ka'anapali Beach is Hula Grill. It's a great place to sit along the beach; watch the sunset, have a cocktail and order some pupus. Served with local tuna, how could this not be good? Lobster & Scallop Potstickers served with Guava plum sauce. 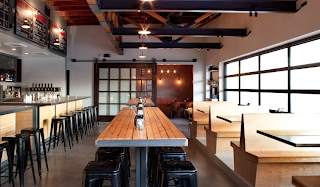 A portion of the proceeds from each Chef's Tasting Menu dinner sold is donated to a local Maui charity. If you've been a follower of my Hawai'i trips, you know that I visit a lot of place to eat, I mean a lot of places. I guess you can say it's an occupational hazard. A lot of times I go to see my restaurant friends and sometimes I just go to eat. On this day, I headed over the Pali to visit my cousins in Kaneohe, but they had too much going on and weren't able to meet up or should I say 'meat up'. So at the last minute, I was driving around Kaneohe and found He'eia Pier by accident. I remembered that it's Mark Noguchi's place, met Chef Mark the last time I was on Oahu. Featured in Travel and Leisure Magazine May 2012 Issue "New Hawaiian Food Revolution"
This time, I was with a group of food and travel bloggers and our first stop was Star Noodle. 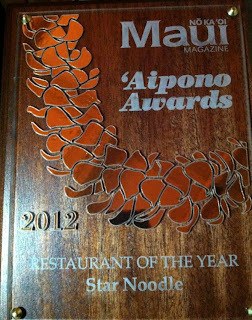 Star Noodle is located at the top of the hill in an industrial area above Lahaina. As we were driving up the hill, Carolyn Jung wondered if I was a serial killer, since it didn't appear we were heading to a place where you'd find a restaurant. I still think she should've called me a "cereal" killer in her article. When you get to the top of the development, you'll see a parking lot full of cars, people waiting outside, AND YES you've found Star Noodle!